by Alameda native Greg Anderson. 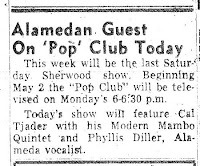 Phyllis appeared on KGO-TV's 'Pop Club' on April 23, 1955. The young stand-up comedienne was approached by my very own grandfather, Willard Severin Anderson, who invited her onto his show. Phyllis started her career at the Purple Onion on March 7, 1955, 1 month before the show. The owner of the Purple Onion, Barrymore Drew, thought she was not doing good in that first month, Phyllis' job there was in jeopardy. Willard told Phyllis to get Barrymore to watch the 'Pop Club' on t.v. and to rethink her future. After her appearance, Barrymore Drew signed a long term contract for Phyllis and she remained there for the next 4 years, selling out there 87 straight weeks. The article I found from the Alameda Times-Star revealed that she was a vocalist on the show. She must have cracked a few jokes on the show. Grandpa said that he couldn't remember her singing on the show. Only jokes. R.I.P. - Phyllis!! Grandpa is still around if anyone wants to ask him anything about his show "Pop Club." She was the greatest ever!! Phyllis' first show back in 1952!